You can adopt a reindeer from our very special free-roaming herd. All the reindeer in our herd have a name and are individually recognisable. 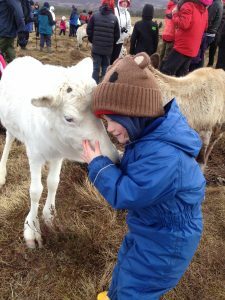 Not only are they happily roaming about in the wildness of the Cairngorm National Park but you can join us on the mountain to see the herd, and often meet your own adopted reindeer. 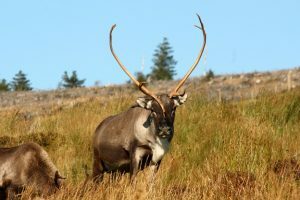 For £39 per year, you can adopt one of our lovely reindeer and, in this way, help to maintain their enviable lifestyle on the Cairngorm Mountains. 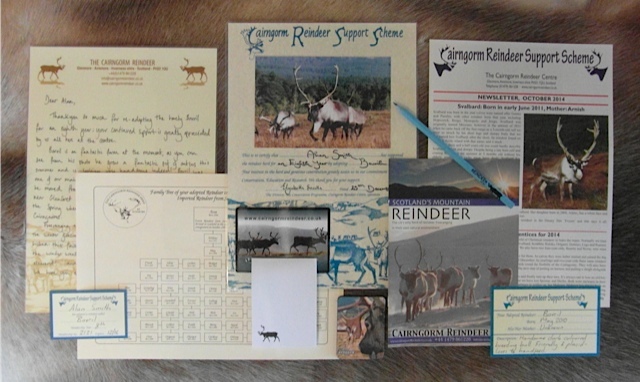 As an adopter, you become a one of our valued supporters and in return for your financial support, you will receive a certificate and photograph of your chosen reindeer, additional information on reindeer and souvenirs along with two newsletters over the year. You can also visit the herd for free. The adoption subscriptions are spent entirely on the upkeep of the reindeer including their food and welfare in the form of medicines and veterinary care. 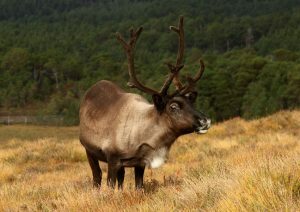 All of the reindeer in our herd are available for adoption, but we just put a small selection of our male reindeer online. The reason for this is that our males spend more of the year in an accessible area where we are able to take you to visit them, whereas the females spend more time free-ranging on the high tops and it’s less likely that you’ll be able to meet your reindeer. 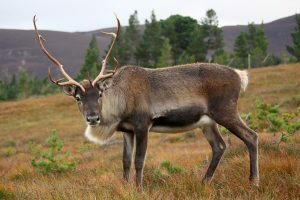 However, if you would rather adopt a female, or know of a different male reindeer not shown online, then just get in touch via phone (01479 861228) or email and we’ll be able to arrange this for you. Scolty is a handsome big lad with beautiful large antlers, although not always the boldest character. He has learnt to pull the sleigh in 2018. 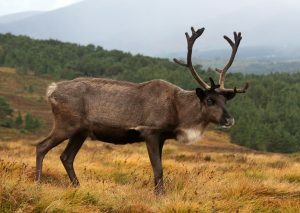 Slioch is one of the darker coloured reindeer in the herd, and is very sweet. He learnt to pull the sleigh in 2018 so was out and about at Christmas time. Stuc is one of the shyer characters in the herd, but his greediness often wins him over and he likes to hand-feed! He learnt to pull a sleigh in 2018. Houdini was born in Sweden in 2011 and joined our herd later that year. He’s a big, impressive chap, and is one of our main breeding bulls at the moment. Ready to become an adopter? Fill in the form below and pay via Paypal, debit or credit card. If you are renewing, please select “Renewal” from the drop down list and enter your I.D. number in the final box. If the adoption is for a special upcoming occasion, such as a birthday, note this special date in the box, otherwise leave it blank and we will date the certificate when we make up your pack. This date must be in the next eight weeks. The default delivery address is the one linked to your Paypal account. If you would like it delivered elsewhere, there is the option to change this when you reach the Paypal page. If you would rather pay over the phone, just give us a call on 01479 861228 during office hours. Due to new data protection legislation, adoptions for children aged 16 or under can only be accepted with permission from the parent/guardian. Please note that we are a small team and make up every pack by hand, so in busy periods it may take us up to a fortnight to get your adoption pack out to you, but we do our best to be quick!